Chatting about knee problems with my prosthetist the other day brought up the topic of my latest bike adaption – an adjustable seat post. They’ve been around for a few years but until recently have been a fairly niche product prone to failure. The target market is mountain bike racers who want the saddle down and out of the way for the rough stuff, then up at the optimum height for pedalling on the flat. Adjustable seatposts enable the saddle height to be changed ‘on the fly’ without stopping. They come in different flavours – mechanical (big spring), hydraulic and pneumatic. Some are controlled with a lever on the seat post, others can have the lever on the handlebar. The height range varies, it can be continuously variable or in discrete steps, and saddle rotation is minimised with varying success. After much armchair research I bought a KS Dropzone Remote. It has 125mm or 5 inches of travel and locks solid at any height within that range using the lever mounted remotely on the handlebars. Fitting it was a breeze, it just took a couple of attempts to get the maximum seat height right and a couple of tywraps for the control cable. I had to get myself a new bike to fit it to (as if I needed an excuse!) because it requires a frame design that incorporates at least 6 inches of ‘free’ seat post. It wouldn’t suit a standard touring or racing bike, but ‘compact’ framed bikes abound these days. Its first test was a trip to Norwich to visit Martin and his Molten Rock Boma incorporating two trains with rides in between; to and from Oxford, Paddington – London Liverpool Street, and a little off-road thrown in through the country park at the Norwich end. I found I could approach station entrances, glide down on the saddle, and continue to scoot through the station in one continuous movement. The 5″ range is just enough to go from optimum pedalling height down to a comfortable, foot almost flat on the floor, sitting/scooting height. Junctions were easier to negotiate, dropping the saddle about halfway as I came to a standstill, my foot within easy reach of the ground. Getting away is more reliable with the saddle lower, and once clipped into the pedal I take the weight off the saddle and it comes up to the full height. Pressing the lever causes the saddle to rise of its own accord, or with some weight on the saddle, to lower. Releasing the lever locks the seatpost at whatever position its in. 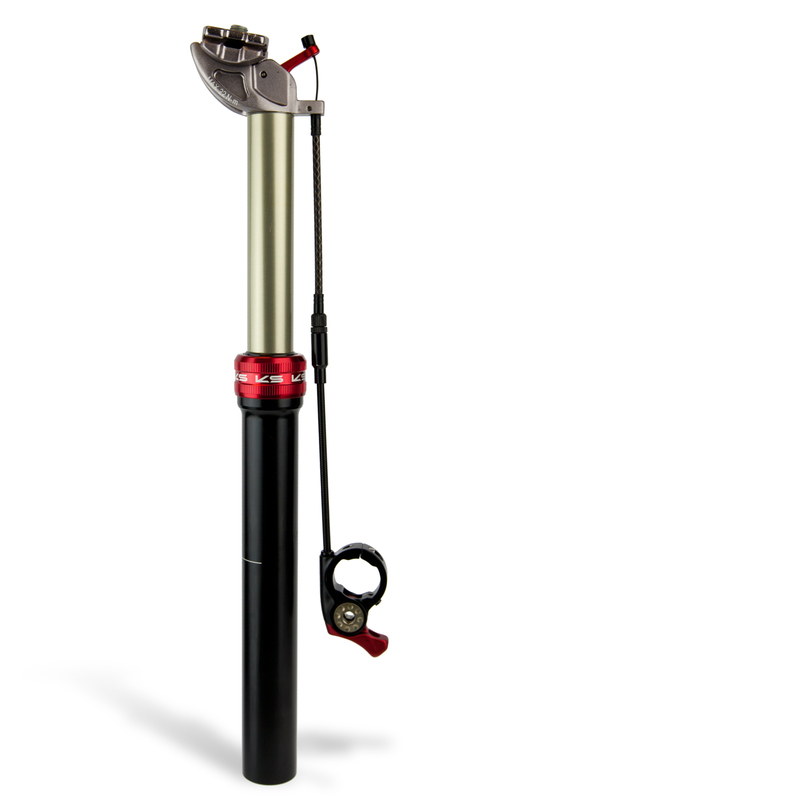 Anyone who can’t physically step up onto a saddle will find an adjustable seatpost beneficial – perhaps making the difference between being able to ride a bike or not. And for those who have to compromise with a lower than ideal saddle height for the ability to reliably reach the floor this could alleviate the resultant knee trouble. I’m a high level lower limb amputee and both apply to me. How robust is it? Well, so far so good. I haven’t used it as much as I’d like yet because I can’t get the right handlebars onto the current stem – the Norwich trip and every outing since has been too much for my shoulders to bear. But that’s another story, hopefully this adaption will eliminate one of the sources of my knee problems. This entry was posted in Inclusive Cycling Forum and tagged bikes, components, disability, review, words on Sun 24 Jun 2012 by kevin hickman.